This cruise is offered exclusively between mid-September and late October – the best time to be on this gorgeous river when the leaves are turning! In fact, La Nouvelle Etoile boasts a long list of premium innovations, such as an elevator, exercise room, and laundry facilities. 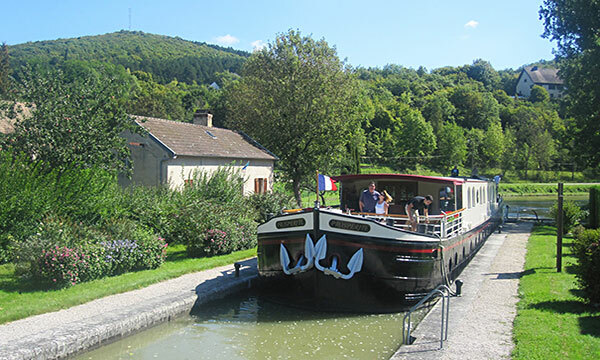 The spacious deck is the perfect place to linger a with glass of wine, admiring the idyllic scenery as the barge gently cruises through the inland waterways of Europe. When not relaxing in the hot tub, guests can explore their cruise region by walking or bicycling along the riverside path. La Nouvelle Etoile’s sightseeing itinerary offers a special immersion into the exciting world of Germanic wines, including tours and tastings at local boutique cellars. A visit to Luxembourg City and a stop at an incredible mountain top castle further the rich cultural activities. Gourmands thrill to La Nouvelle Etoile’s extraordinary culinary experience, which features Germany’s seasonal ingredients and regional specialties, served at a table replete with elegant Wedgewood china, Christofle silver, and the finest crystal. Wines are selected from both local vineyards and New World producers, reflecting La Nouvelle Etoile’s international roamings. 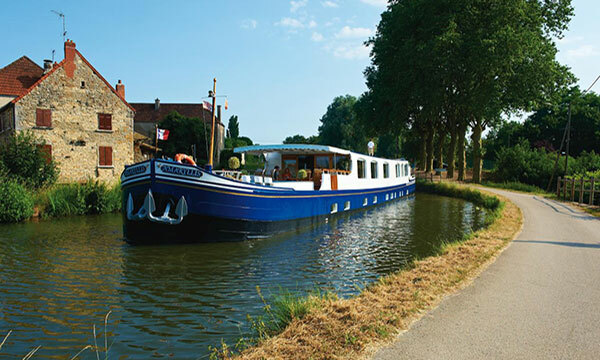 In the afternoon, you will be met by a crew member of La Nouvelle Etoile at the designated meeting point. From here, relax as you are chauffeured to the barge, moored in the delightful town of Remich. A traditional champagne welcome and introduction to the crew awaits you, before your first of many gourmet dinners onboard. End the evening with a nightcap in the hot tub. This morning, your Tour Guide escorts you to the Luxembourg American Cemetery and Memorial, where General George Patton Jr. is buried. Afterwards, enjoy a walking tour of Luxembourg City, a striking and newly fashionable destination. Return to the barge for an afternoon cruise on beautiful River Mosel. Laze on deck in the hot tub, or explore the riverside path by bicycle or on foot. Tonight, Chef presents another gourmet dinner. This morning's excursion is to Trier, the oldest town in Germany. Your Tour Guide accompanies you to visit Roman ruins including the Porta Nigra, a huge city gate and fortification, as well as several baths and a 25,000-seat ampitheatre. Return to the barge for a picturesque afternoon cruise to tonight's mooring in the traditional and colorful town of Bernkastel. This afternoon, taste the famous local wine in the cellars of Dr. Pauly Berweiler. Back onboard it's time for cocktail hour and another gourmet dinner. This morning, explore the lively market town of Bernkastel. An afternoon cruise culminates at Zell, one of the most beautiful moorings on the river, and home to the famous Schwarze Katz or "Black Cat" Mosel wines. 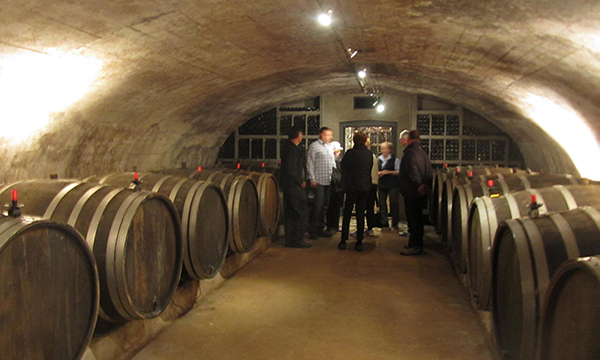 Visit the cellars of Dr. Josef Weis this afternoon. There, Peter Weis leads you through a tasting of some of his own Black Cat wines. 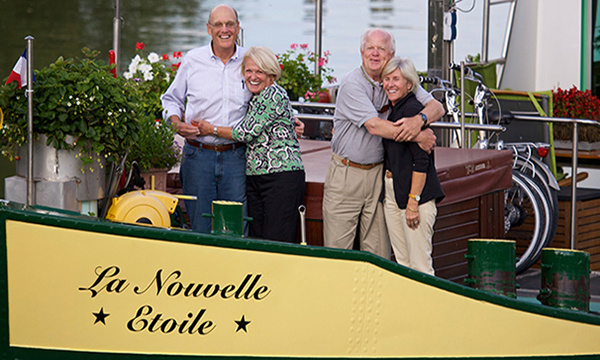 After free time to sip, shop, and stroll your way through this charming riverside town, your Tour Guide returns you to La Nouvelle Etoile for drinks and dinner onboard. This morning's cruise is the perfect opportunity to explore the riverside path with a gentle pedal or leisurely stroll. This afternoon, your Tour Guide escorts you to one of the true highlights of the cruise: Burg Eltz, a fairy-tale castle nestled high in the hills. It is still owned by a branch of the Eltz family, having occupied the castle since the 12th century. Many consider it Germany's best-preserved castle, furnished as it was 500 years ago. Return to La Nouvelle Etoile for an amble around the lovely port before drinks and dinner. Cruise in the morning to Koblenz, a major port town at the confluence of three rivers. This afternoon, your Tour Guide accompanies you on a walking tour of this historic village. Enjoy free time to walk through the pedestrian areas lined with lively cafes, local shops, and specialty boutiques. Return to La Nouvelle Etoile to freshen up for tonight's celebratory Captain's Dinner, perhaps followed by an after-dinner drink at a nearby "bier-stube".